Page revised in January 2017. The location covered in this page was visited in April 2010. 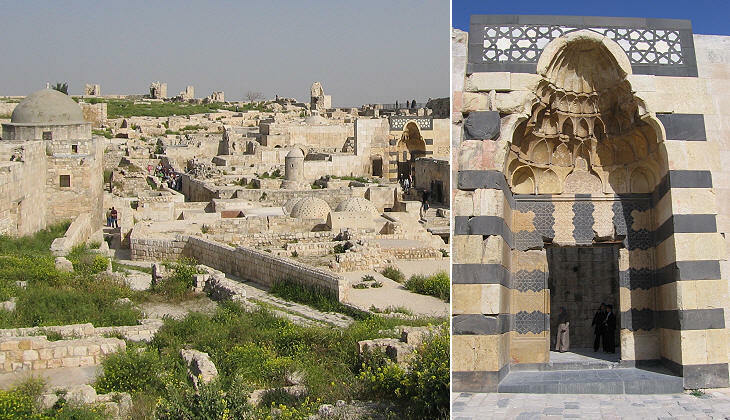 This page is based on a visit to Aleppo which was made in April 2010. It does not reflect the impact of the Syrian civil war on the inhabitants and the monuments of the town. Aleppo is covered in this page which deals with its fortifications and in two other pages showing its monuments before and after the 1516 Ottoman conquest. 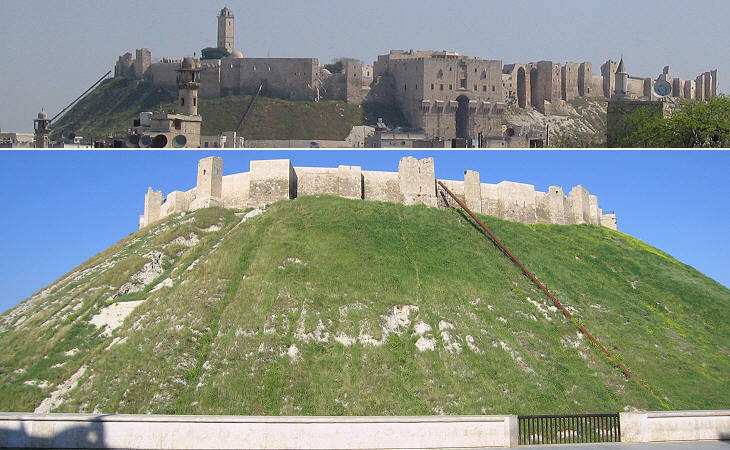 The hill at the centre of modern Aleppo was already inhabited at the time of the Hittites; the town was called Halap and the location was chosen because it was midway between the Euphrates and Orontes rivers. The Seleucids renamed the town Beroia, yet the ancient name was not forgotten and over time it prevailed. 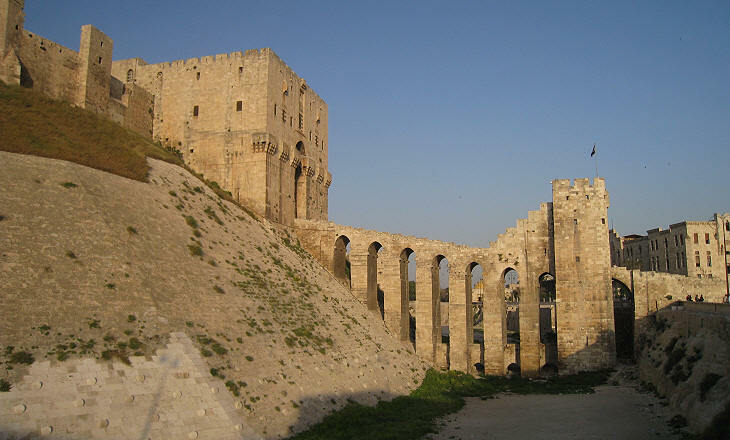 During Roman rule Aleppo was made up of an acropolis on the hill and of a large settlement to the west of it; the straight street which today houses the souks of Aleppo and which crosses the old city from the Citadel to Bab Antakya, its western gate, follows the path of decumanus maximus, the east-west street of the Roman city. The shape of the acropolis was profoundly modified by the fortifications built in 1210 by al-Malik az-Zahir Ghazi, third son of Saladin, who ruled over parts of northern Syria; Aleppo was threatened by the kings of Lesser Armenia who had gained control of the Principality of Antioch, a crusader state which bordered on al-Malik territories. The hill was surrounded by a deep moat and its flanks were given an artificial inclination which made the excavation of tunnels to make its walls collapse very difficult; parts of ancient columns were used to consolidate the conical shape of the hill. A huge tower protected a long bridge which was the only access to the Citadel. At the end of the bridge two massive towers protected the entrance to the Citadel; the actual gate opened into the left side of the right tower, so that the attackers had no room to utilize battering rams; inside the tower four other gates placed along a turning passage were an additional obstacle to the enemy's advance. Yet in 1260 the Mongols managed to conquer and sack the Citadel. The towers were restored by the Mamelukes, who ruled over Egypt and who first checked the advance of the Mongols and then forced them out of Syria. The two towers were linked together by a massive building in the XVth century: it housed the residence of the Mameluke governors of the city. 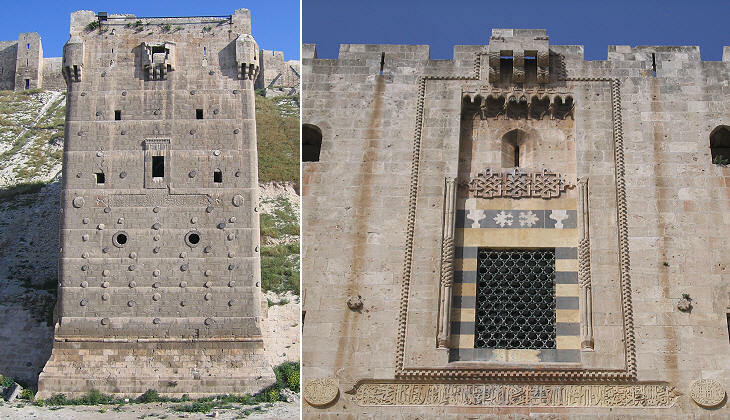 The Citadel was conquered again in 1400 by Timur, but the Mamelukes regained control of Aleppo in the following years and they built two isolated towers at the foot of the hill; the images above show key features of Mameluke architecture; elegant and well proportioned design and a limited use of decoration mainly based on the contrast between yellow and black stones; the medallions at the sides of the inscriptions contain the names of the governors. 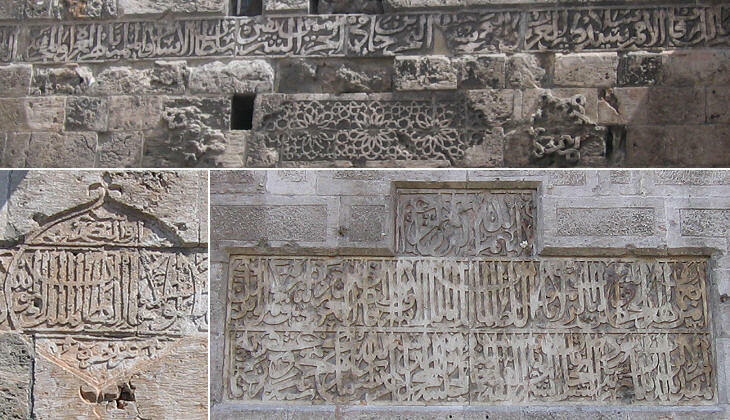 When comparing the fortifications of Aleppo with those of Diyarbakir one is struck by the fact that those of Diyarbakir are decorated with lions, eagles, horses, bulls and even sphinxes, whereas in Aleppo the prohibition of portraying living beings was much more strictly respected, especially by the Mamelukes. 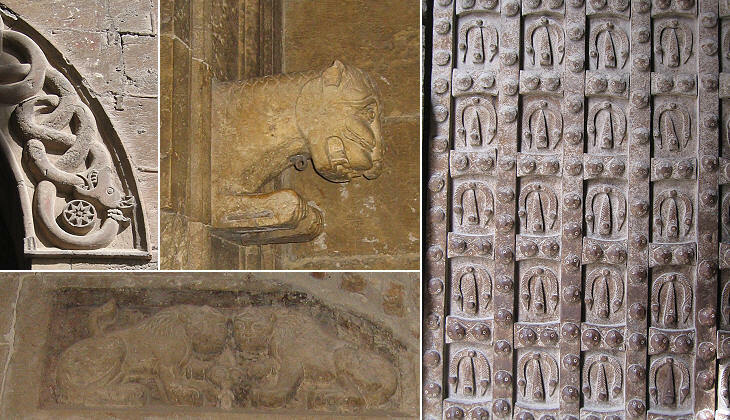 The few portrayals of animals are almost hidden in the interior of the tower housing the entrance gate. 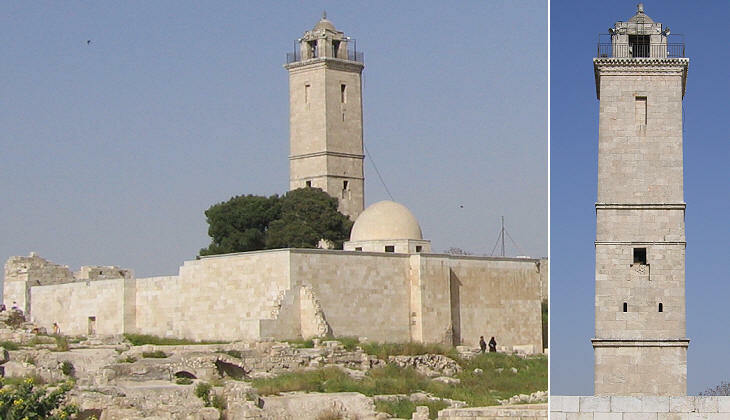 Al-Malik az-Zahir Ghazi built a mosque with a tall square minaret on the highest point of the Citadel; the minaret, in addition to being used for announcing the time of prayers, ensured a commanding view over the city and the surrounding area; its shape was inspired by the minaret of the Great Mosque (page two). According to tradition Abraham lived for some time in Aleppo (a cave in nearby Urfa is said to be the hiding place where Abraham spent his first ten years). On the assumed site of Abraham's hut a small mosque was built in 1167. 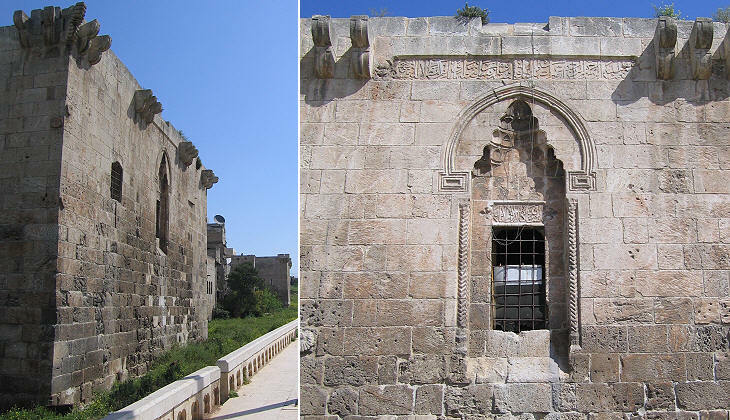 This mosque, a hammam and an elegant Mameluke portal are the only buildings which can be identified among the ruins of the barracks. 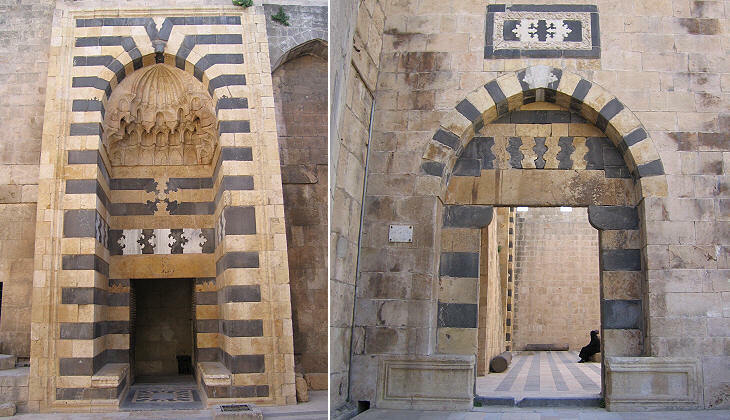 A series of large portals lead to the Mameluke Governor's residence which could also be accessed by hidden stairs starting at the entrance gate. The image used as background for this page is based on the decoration of a courtyard preceding the entrance to the residence main hall. 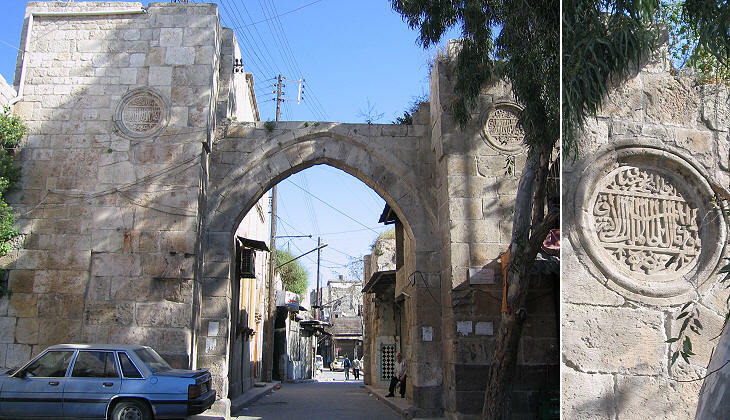 The lower city of Aleppo was protected by massive walls of which only a few sections have not been modified by the opening of streets or by the construction of houses; the remaining finest stretch of the walls is located near Bab Qinnesrin and it includes a nicely built and decorated tower. On a hill to the south of Aleppo, a mosque called Maqam Ibrahim was built above the rock upon which Abraham rested on his way out of the city; Bab al-Maqam, the gate on the road linking the Citadel with this mosque, was built in 1230; it probably had a ceremonial purpose because it is the only one not to be hidden in the side of a tower. 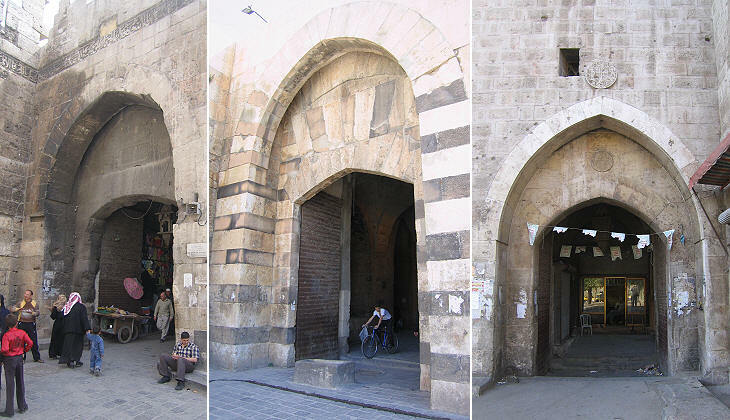 Today the gate is surrounded by a very crowded neighbourhood and Bab al-Maqam is the name of a popular Syrian soap opera. 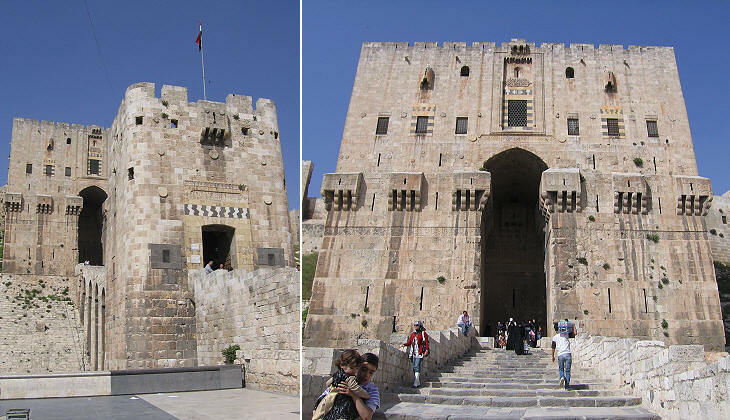 The other remaining gates are all built into the side of a tower; the most important of them is Bab Antakya; most of the monuments of Aleppo, its souks and khans (inns for travellers) are located between this gate and the Citadel.